A vast cave complex in southwestern France, Lascaux is best known for its many Paleolithic cave paintings. The Lascaux Cave was discovered by four teenagers, Marcel Ravidat, Jacques Marsal, Georges Agnel and Simon Coencas on September 12, 1940. There are nearly 2000 figures of animals, humans and abstract signs inside the cave. The animals that were painted include stags, cattle, bisons, felines, a bird, a rhinoceros and a bear. Lascaux doesn’t seem to have been occupied but rather visited periodically just for the purposes of painting. In 1948 Lascaux was opened to the public but the amount of daily visitors to the cave were changing the atmosphere inside the cave so it was closed in 1963 and 20 years later an exact replica, Lascaux II was opened. Today the cave is under attack by a series of molds, fungi and bacteria threatening to erase this priceless work of Prehistoric art. The Lascaux Cave is not only the largest Prehistoric cave in France, but the most well preserved. 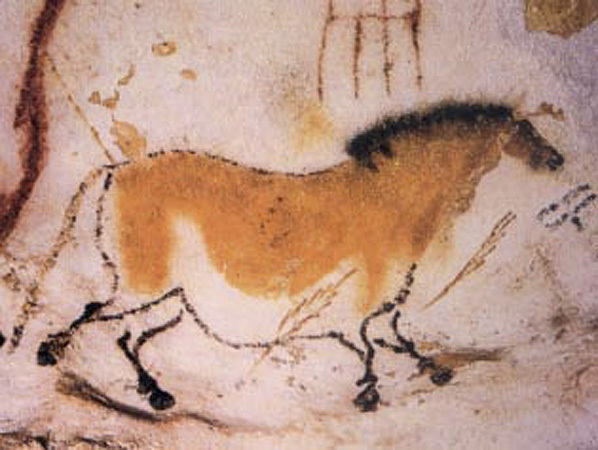 One of the paintings called “The Crossed Bison” shows the skill of the cave painters to capture realism. The ability to use perspective was not used again until the 15th century. From these paintings we can also determine what type of animals were available and important to the painters.